ROBERT SHILLER, A 67-YEAR-OLD Yale University professor best known for his early, accurate prediction that U.S. house prices were a bubble just waiting to burst, has long worked at the intersection of psychology and economics. He recently shared the Nobel in economics for insights into why prices of stocks and houses fluctuate as they do, particularly work showing that markets move too much to be explained by rational investors responding to changing fundamentals. Q: One theme that runs through your work is that people tend to make mistakes over and over again. That’s quite different than what I learned in college economics—that people are rational. How did you start thinking about people’s mistakes? A: When you went to college, the economics profession had reached an unnatural state. Mathematical models of rational behavior became the rage. It was just an abnormal time. I was reading more widely and wanting to come back to reality. Q: Was there something you saw in reality that led you to this? Q: Are bubbles always a bad thing, or do they have some good effects? A: First of all, it’s a free world and people can do what they want. I’m not proposing we put the straightjacket on these things. The other thing is that human nature needs stimulation and people have to have some sense of opportunity and excitement. I think profits are an important motivator. In the long run, it’s hard to say that bubbles are really bad. Take the Internet bubble in the 1990s. What that did was generate a lot of start-ups, some of them foolish, some of them failed, but others survived, so is it a bad thing? I find it hard to think what the alternative would be. We could have had a Federal Reserve that tried to lean against that. Ultimately, our policies in economics are somewhat intuitive and our models are not accurate enough to tell us what the right policy is, so I’m thinking we might have been better off if we tamed these bubbles, but there is no way to be sure. Q: A lot of what you do is at the intersection of psychology and economics, and your wife is a psychologist. Did that have any effect on how you developed your work? A: I’m sure it did. This is the basic principle of psychology: Nobody can explain their mindset, where it came from. People think of themselves as such original thinkers when, in fact, most of their thoughts have been transmitted to them from other people. And there are certain stories in circulation and they are all in all our minds. Psychologists have argued there is a narrative basis for much of the human thought process, that the human mind can store facts around narratives, stories with a beginning and an end that have an emotional resonance. You can still memorize numbers, of course, but you need stories. For example, the financial markets generate tons of numbers—dividends, prices, etc.—but they don’t mean anything to us. We need either a story or a theory, but stories come first. Most people don’t really get around to much in the way of theory. Q: Do you tell investors that they can pick winners in the stock market, or do you tell them they’re not expert enough and that they should go to index funds or other products? A: I tell people to get an investment adviser; that makes sense to me. The question is often whether it’s possible for anyone to pick stocks, and I think it is. It’s a competitive game. It’s like some people can play in a chess tournament really well, but I’m not recommending you go into a chess tournament if you are not trained in that, or you will lose. So for most people, trying to pick among major investments might be a mistake because it’s an overpopulated market. It’s hard. You have to be realistic about how savvy you are. But if you are thinking about buying real estate and renting it out, fixing it up and selling it, that’s the kind of market that’s less populated by experts. And for someone who knows the town, that’s doing business, I’m not going to tell someone not to do that. Q: Do you think of yourself as someone smart enough to pick winners in the stock market? A: Well, I actually think I’m smart enough to pick winners. I’ve always believed in value investing. Some stocks just get talked about, and people pay all sorts of attention to them, and everyone wants to invest in them, and they bid the price up and they are no longer a good buy. Other stocks, they are boring. There is no news about them—they are making toilet paper or something like that—and their price gets too low. So as a matter of routine, you buy low-priced stocks and sell high-priced stocks. Can new kinds of insurance protect us from turmoil in our careers or in the real-estate market? 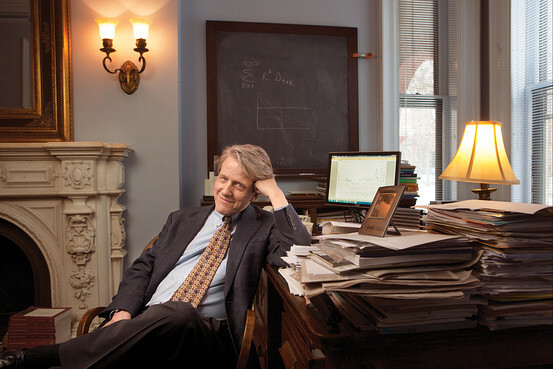 Yale economist and Nobel Prize winner Robert Shiller tells WSJ.Money contributor David Wessel that they can. Q: What’s your personal track record: Are you more up than down? A: I have never done a personal analysis. I have to do that. But I believe that I’ve done well in timing the market, although not perfectly. Q: In the late 1990s, when the stock market was looking a little frothy, you delivered a presentation at the Federal Reserve. Your wife later said you expressed concern that you were the one who planted the idea of “irrational exuberance” in Alan Greenspan’s head. A: What you said is absolutely right. Greenspan said the words “irrational exuberance” in an evening speech in Washington, and the Tokyo market, which was still open at that time, immediately crashed and then it spread over the whole world as the markets opened. That’s why “irrational exuberance” is famous. Greenspan didn’t coin it, I didn’t coin it—it was an old phrase. But he just happened to use that phrase and the market immediately crashed. Q: Did you really feel responsible? A: I came home and told my wife, “I might have started a world-wide market crash.” I said it sort of joking, but I half believed it. The markets are that crazy. The power isn’t in me, it’s in Alan Greenspan, but I had his ear. I spoke before the Federal Reserve Board and then I had lunch with him. I was talking, so it’s possible. This is a method of thinking about the economy that’s very different. It makes the economy sound unstable and affected by individual people. Q: When you look at housing, do you think that the world has changed in that people don’t regard it as a sure-thing investment because of what we went through? A: You referred to an idea that housing is a great investment. But I think if you go back in history that was not the conventional wisdom. You stop a man on the street in 1875 or 1950 and say, “I’m going to buy a bunch of houses and invest in them. What do you think?” I think the usual response the guy would give is, “Are you sure about that? There’s a lot of maintenance. They’re going to go out of style.” If you can create a business renting them out, maybe it’s a great investment. But just betting on their price going up, I don’t know. I think that was an idea that took hold particularly during the early years of the 21st century. Ultimately, people are motivated by human-interest stories about somebody who did something amazing because those stories are more resonant, they create a sense of envy and competitiveness. If I’ve heard stories about someone who bought condos or houses and flipped them and made a huge amount of money, and I think to myself I could have done that, it generates emotional turmoil that drives you to do it. So I’m thinking that’s kind of what was happening in the housing market in the early 2000s and in the stock market in the 1990s. Q: You have two houses, one in New Haven and one in Stony Creek, Conn., right? A: Right. It’s on an island. We bought that as not an investment—we just thought it would be fun. Q: If others want to invest, do you advise them to think about the stock market, and if they want to buy a house, do you tell them to live in it? A: Anything like that is too simple. I’m not enthusiastic about random people buying houses as investments. I think it’s a business. You can buy houses and rent them and make money, but that’s something that takes effort and time. Q: We’ve seen an extraordinary period where the gap has widened between winners and losers in society. What should we do about that? A: We should start preparing for a day, maybe 10 or 20 years in the future, when inequality may be much worse. We don’t yet know whether it’s going to be worse. We should have a contingency plan now. The simple idea I have is raising the taxes on the rich, which sounds like the most politically inexpedient move right now, but the nice thing is that when you talk to people about risks of the distant future, they are more idealistic and more sharing in their attitudes. Q: So we’d have a tax increase on wealthier people that would go into effect if some measure of inequality reached a certain point? A: Yes. If billionaires turn into multi-billionaires, we don’t let that happen. If you want to make $10 billion and spend it on yourself, we won’t let you. We will take a good fraction of it, and you’ll still be a billionaire, so what? The other side of it is I think we should expand the charitable deduction, so if you make $10 billion and you want to give 90 percent of it away, you can give it away with your name on it so it enhances your prestige, but give it away and you should be able to deduct it. Q: So we would more aggressively redistribute income from the top? A: From selfish people at the top who don’t want to give it away. You could turn into a Bill Gates or an Andrew Carnegie. I think that’s OK. Instead of just taxing people—saying, “We’re just taking the money, and you’ll go to jail if you don’t turn it over”—we can find a better way. Q: Winning the Nobel Prize does guarantee the first line of your obit, but it also gives you a kind of exalted status: What you say must be more true than what other people say. Do you worry about that at all? A: A little bit. I think that economics is not an exact science. It tends to be politicized. It happens when I’m interviewed in occasions like this, I have a sense that you expect me to come up with answers for every one of your questions. But maybe I should say, “I don’t know” more often. At this year’s Nobel ceremony, I was impressed that [co-winner] Gene Fama said “I don’t know” a lot. He kind of avoids the media, so maybe I could learn a lesson from him.